Turn, flip, or rotate pallets, material, and parts. Our standard pallet inverter can handle pallets 48" x 48" x 60" high. The robust steel rotator comes with a handheld pendant station. 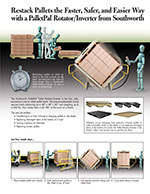 It inverts an entire pallet 180 degrees, and can handle a load up to 4,400 pounds. The unit has an anti-friction turret bearing with the ability to adjust the pressure, you will reduce the risk of damaging the product when rotating the load. The pallet rotator essentially prevents the customer from having to restack a entire pallet by hand, which in some cases can take up to 20 times longer. This is a waste of time, money and limits productivity. The inverter unit is equipped with a safety rail. 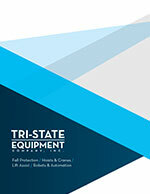 This provides a visual alert as well as a physical barrier to protect your operators. 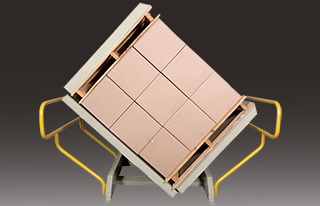 Forklift pockets, located in the base of the unit, allow the unit to be relocated quickly. There are multiple reasons why you would use a pallet inverter: Replace broken pallets, Transfer from pallets to slip sheets, Replace damaged goods at the bottom of the load, Switch loads to company owned pallets to shipping pallets. Our pallet rotator features Dual clamping; both clamp plates move equally toward center, resulting in the load center being near the center of rotation, this means lower stress on the rotating mechanism as opposed to a "single clamp". Use of cylinders and chains equalizes movement and clamp force. Check the chart below for a list of features, select a model and call (314) 884-8884 or email sales@ergonomicpartners.com for pricing. Upenders and upender lifts are used to rotate steel coils and other cubic loads though 90 degrees. Our upenders are custom engineered for your particular application to up-end or down-end any coil, die or heavy product. 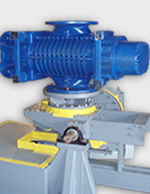 Mechanical upenders are built with a cylindrical shaped cradle that is placed on four machined rollers, and is rotated by means of a gear motor. They usually have two platforms that are square and of equal size on either side of the machine. Named for their circular shape, are ideally suited to production line or high volume operations. They can be loaded and unloaded from the same point by either a forklift or a conveyor. Barrel inverters can also be customized suit your application with a wide variety of options including: Long reach hydraulic scissors clamping, Multi-direction clamping, Programmable logic controllers that automatically sequence loading and unloading, Selectable pressure settings, Gravity or powered conveyor platforms. We can manufacture other innovative features that increase the efficiency and productivity of your processes. Ergonomic Partners sells and distributes pallet inverters; serving clients from coast to coast, Canada, Mexico and especially focused in the states of Missouri, Illinois, Indiana, Kansas, Arkansas, Mississippi, Nebraska, Tennessee, Kentucky, Iowa, and Oklahoma.